Museum Note: The story of McKays’ Clipper Mill is presented here with the kind permission of the Calaveras County Historical Society, CCHS. CCHS Editor’s Note: Sawmills have always been one of the vital segments of the Sierran economy. As we all remember, it was at Sutter’s sawmill that gold was first discovered in the Sierras. Ever since, lumber has been in great demand in our mountain counties. It is true that, for many decades, gold mining almost totally eclipsed the timber industry. But, as gold mining dwindled, and the market for lumber expanded, timber became progressively more important and today constitutes our most important single industry. The early sawmills were small, crude, and inefficient by today’s standards. But when one considers the prodigious amount of labor needed, the obstacles to overcome, and the successful end result, one cannot but be impressed by this effort. This issue is about just one mill, but this one is typical of many other Sierran mills. The McKays came from a vigorous and able Scottish family that emigrated to Nova Scotia. One of the Nova Scotian members of the family, Donald C. McKay, became the most celebrated builder of clipper ships in American in the mid-1800’s. His “Flying Cloud”, “Sovereign of the Seas”, “Lightning”, and “James Baines” were the fastest commercial sailing vessels ever built, as well as being the most beautiful of the clipper ships. It is no wonder that Donald’s cousins in Calaveras County named their sawmill, “The Clipper Mill”. McKays’ Mill was established in 1885, after Charles Lane told Nathan McKay that he needed lumber for his Utica Mine in Angels Camp. “Nate,” he said, “you build a sawmill and I’ll take all the lumber you can deliver.” Nathan sent for his older brother, John, who was running a sawmill for their father in Nova Scotia. Their mill was set up along today’s Love Creek Road (formerly called Sawmill Creek for the establishment of the mill) about two miles south of Big Trees. Charles Lane also approached John Manuel, the owner of Manuel Mill on San Antonio Creek, who was then the “Lumber King” of Calaveras County, with the same proposition. The result was intense competition between the two. Nathan McKay and John Manuel were the best of friends until it came to business then, “Look out!”. This invoice will enlarge by clicking on it and will give you a very clear image with remarkable information about the quantity of timber purchased and the price. 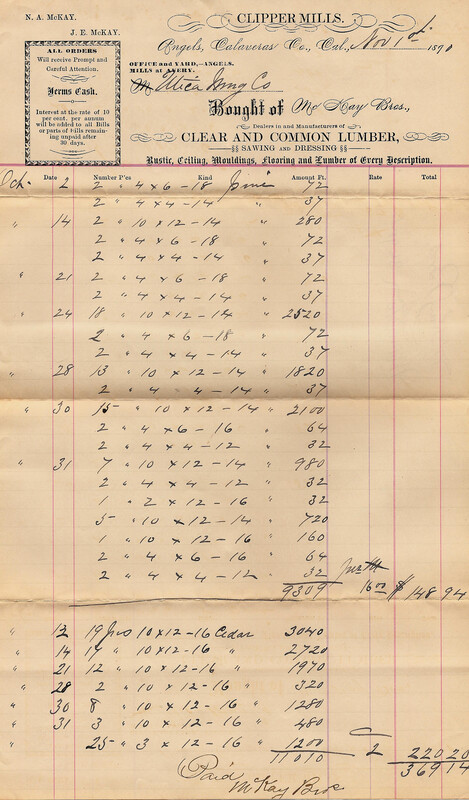 has a large number of old invoices and checks from the Utica Mine. The McKay boys came from adventurous Scottish stock. Their grandfather, John Even MacKae (from the Gaelic, pronounced MacKi), and two of his brothers were Nova Scotia pioneers. Nathan A. McKay (the younger members of the family changed the spelling of their last name in the New World) was born in Nova Scotia in 1853. Nathan came to California in 1873 where he worked for relatives for a year or two in their sawmill in Scotia, California, and then headed for the Mother Lode. He arrived in Placerville where he bought a team of oxen and went into business hauling heavy machinery and logs from rough and difficult places where no one else would go. In the late 1870’s, a job brought Nathan to Mokelumne Hill. While he was there he heard that it was difficult to find anyone who would haul logs out of the woods to the local sawmills because the terrain was so steep and rocky. To Nate, the job sounded like it was “right up his alley”. He went to see Elias Field at his Phoenix Ranch near Rail Road Flat about a contract to furnish logs to Field’s sawmill. While Nathan and Elias were in the Fields’ sitting room discussing the logging deal, there was another “deal” going on behind the rose-colored portieres dividing the room. Field had two daughters. Ida Elisabeth, 19, was the curious one, and Carrie Minerva, 17, was the mischievous one. The girls were surreptitiously peeking through the portieres at their father’s guest when Minerva gave Ida a quick shove that propelled her across the room and right into Nate McKay’s lap. This was the introduction which some three years later culminated in marriage for the pair, and in sequence, four children. When John E. McKay arrived from Nova Scotia in mid-1885, he and Nate lost no time setting out to look for timber. They found a homestead on Love Creek with a good tract of timber. When they found the owner, “Doc” Jones, he was busy playing poker at the Murphy’s Hotel. Scarcely looking up, Jones told the McKay boys to go out to his home and talk it over with his wife. They did and the deal was made. Eight hundred dollars for the one hundred and sixty acres. That summer, the McKays started building the sawmill in the southern end of the meadow. They finished a bunkhouse, a cookhouse and some small buildings. That winter there was a heavy snowfall and a depth of twelve feet was measured on the meadow. It crushed the new buildings, a disaster for Nate and John. The boys grimly rebuilt but this time with three-quarter pitch roofs so the snow would slide off before it got too heavy. A big barn, sixty feet long and thirty feet wide, was built to house three fourteen-animal teams and four yoke of oxen. There were smaller barns for hay. The sawmill was completed the next year and the first logging operations began. Teams of oxen, two in a span, six or eight spans to a team, or sometimes teams of six horses plus two oxen to handle the heavy wagon tongue, pulled the logging wagons. The wagons had solid wood iron-bound wheels. The logs were hauled out of the woods to the “log landing” on a slope above the mill. The one hundred sixty acres proved to have one of the heaviest stands of sugar pine in the region. The area produced fifteen million board feet of lumber, 70 percent sugar pine. It took almost five years to complete logging operations. Most of the trees measured six to eight feet in diameter, while one of the largest had a diameter of eleven feet. In order to fit the wagons, logs measuring over six feet were blasted in half by boring a hole into the log, pouring in black powder and touching it off. In 1888, when the logging got too far from the mill, the McKays built a railroad up the right side of the creek along the foot of the ridge. The cars were made from heavy timbers reinforced with iron bracing. The wheels and casting were manufactured by the Demarest Foundry in Altaville. The cars were then assembled in the blacksmith shop at the McKay Mill. Each car was capable of carrying logs totaling 4,000 board feet. The rails were laid on a roadbed at the precise grade at which the cars would attain only that speed which could be regulated by the brakes. To haul the empty cars back to the top of the track, teams of oxen provided slow, but steady power. A total of twenty five million board feet of logs were hauled to the mill on this railroad. Rails to McKays’ Mill. The steam donkey (on the left) pulled trees out of the woods, and the pair of oxen (on the right) will trudge back to the mill so they can pull another empty wagon, perhaps several, back up the rails to the woods. Gradually the railroad was extended to the top of the ridge. One spur was built one-fourth mile farther up Love Creek. Another spur to the left up the ridge reached the boundary of the Calaveras Big Trees State Park. Some of the old cedar ties are still scattered along the remains of the railroad bed. 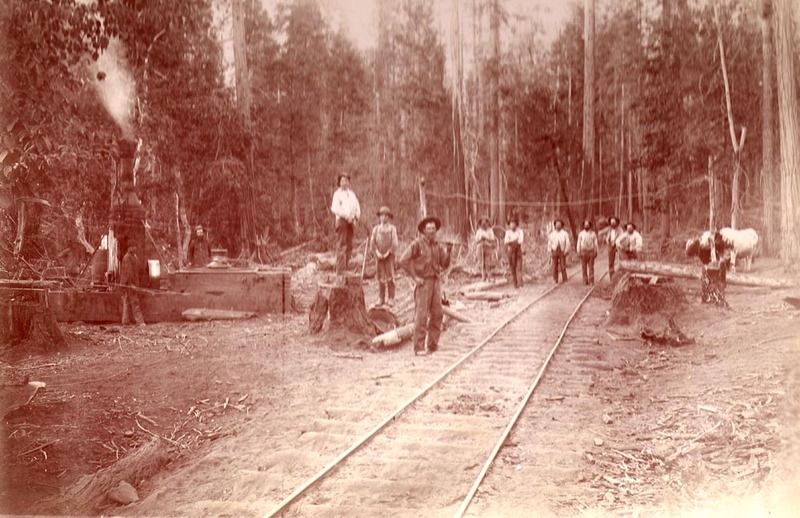 When timbering began below the sawmill in the 1890’s, additional track was laid for three-quarters of a mile. A steam traction engine was purchased from the Placerville area, where it had been used in the mines, to haul the logs to the mill. The traction engine had been manufactured at the Demarest and Fullen Foundry in Stockton, built around a 180-pound capacity steam boiler and firebox, riveted together as one piece, that came from the Babcock-Wilcox Company in Scotland. She was converted into a small locomotive by having flanges installed on her wheels. One of the McKays’ men drove it all the way back from Placerville. The fiery wood-burning monster, enveloped in clouds of steam emanating from her boiler, hissed and spit as she rumbled along. She created quite a stir along the way, thundering though Murphys in the dead of night, arousing inhabitants and animals alike. Dogs roared, chickens squawked, donkeys brayed, horses and cows fled in terror. The residents ran pell-mell into the streets in their nightgowns, sure that the end of the world had come. It was quite some time before the commotion subsided and everyone went back to bed. The ox-team drivers, angered by the threat that the “infernal machine” posed to their livelihood, contemptuously dubbed her “Jenny” generally prefacing the name with a most descriptive, but unprintable, adjective. In an effort to out-log “Jenny”, a logger named Howard Dickey became careless in his haste to unload his logs. One of them broke loose and hit him in the back of the head, killing him instantly. The rest of the logs rolled over his body. When the McKays heard the tragic news, they broke down and cried. Their workers were considered members of the family. “Jenny” was last used to haul logs in 1904 and then stood for years rusting quietly away in the woods until she was rescued and removed to a position of honor in front of the museum in Angels Camp. 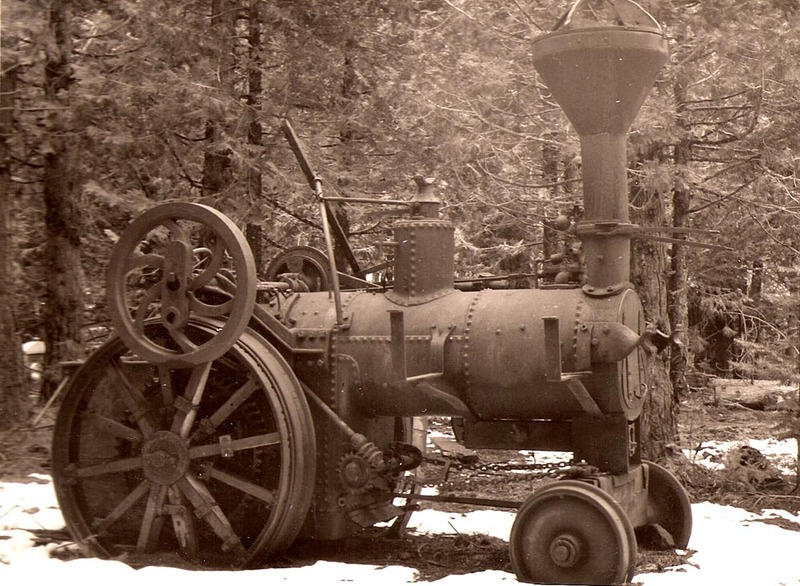 The steam traction engine, Jenny, sits in mud and snow deep in the woods long after being abandoned by the McKays. Note that the engine has a steering wheel and that the front wheels can turn left or right to allow the engine to be steered when it is off the rails. The McKay operation expanded by gradually buying out five surrounding homesteads. The sawmill grew to be the largest operation in the area, at its peak producing twenty-five thousand board feet of lumber a day. The McKays averaged three million board feet a year for a total of sixty-one million board feet over a period of twenty years. McKays’ Clipper Mill held the record for lumber production in Calaveras County until the Blagen Mill was built at White Pines in 1938. The McKays’ lumberyard was located in Centerville (Altaville) across the street from the Blue Wing Saloon. The finished lumber was hauled to the yard at twelve to fifteen thousand board feet to the load. Two wagons were used for each load pulled by teams of twelve to sixteen mules, with two horses as “wheelers”. The wheels of the wagons were solid wood, sawed off the ends of logs, and bound with iron rims. Nathan McKay was in charge and at his wife’s insistence, was seen always attired in a white shirt. Nate McKay thought much of the teams of animals who served him so faithfully. When their useful days were over, he could not bear to send the animals to the slaughter house as was the custom. They were put out to pasture and well cared for the rest of their lives. The McKays lost one of their drivers along with two or three of his mules coming down Hanford Hill. [The entrance to the Forest Meadows subdivision along present-day Highway 4 is at the top of Hanford Hill]. The driver had stopped at the Wildcat Saloon where he tarried long enough to get drunk. Because his judgment was impaired he lost control of the team. Driver, team, load and all pitched over the embankment in shambles. One day in the late 1800’s, Nate McKay was visiting the Big Trees Hotel. A man sitting on the porch jokingly asked, “When are you going to start cutting the Big Trees, Nate?” Somehow the story that Nate McKay was going to log the Big Trees reached the Stockton Record, which threw all its editorial vigors against the mythical endeavor, creating quite an uproar. The meadow where the McKays built their sawmill was called Murdock (Modoc) Clearing, said to be named for the chief of the local Miwok Indian tribe near Vallecito. The Miwok tribe made their summer encampment in the meadow. There many artifacts, especially arrowheads, have been found. It is sad to relate that the tribe’s original holdings near Vallecito have dwindled down to one or two barren acres. McKays’ Clipper Mill shut down in 1906 when the timber ran out on the Love Creek property. The mill was moved to Merrill’s Springs, in Tuolumne County. McKays’ Mill at Merrill’s Springs remained in operation until it was demolished by fire in 1922. The flames broke out at 3:30 a.m. caused by sparks, fanned by a high wind, from the sawdust pit. McKays’ Clipper Mill was no more. The late Clarence McKay, Nathan McKay’s youngest son, sold the major part of the family holdings. With a deep appreciation of the natural beauty of the Love Creek area and a sincere interest towards maintaining that beauty, Clarence limited the size of each parcel that he sold to a minimum of ten acres. Thanks to Clarence McKay’s thoughtful foresight, we now have along Love Creek one of the most beautiful natural areas remaining in the Sierras today. This story was originally printed in Las Calaveras, the quarterly bulletin of the CCHS, Volume XXIV, January 1976, Number 2. For the Logging Museum’s website, the original, extensive, article has been excerpted and gently edited to focus on Nathan and John McKay and their sawmill. Copies of the original, full article are available from CCHS, 209-754-1058, or cchs@goldrush.com. Alma McKay is the last member of the McKay family in the county and while related to the McKay’s by marriage, she cherishes the family pictures and history that she has inherited from her “Mac,” (Clarence McKay). She has spent many hours putting together the family genealogy. What emerges is a picture of determined, adventurous and hard working Scotsmen who were a credit to themselves and their new country, the United States. They settled in Calaveras County and many people still remember the McKay’s, their prosperous Clipper Mill and the landmark know as McKays Point where part of the North Fork project is settled. The Scottish Mackaes (the spelling was changed to McKay in California) were a shipbuilding family and were experts in building the speedy Clipper Ships that were the romance of the seven seas. They were established in Halifax, Nova Scotia, and young Nathan McKay, Clarence’s father, was apprenticed to his uncle. It was tradition in Scottish families that apprentice wages earned were turned over to the head of the household. One day, Young Nathan had had enough of that custom and collected his own wages before his father came for the money and then made arrangements with a sea captain to ship out as a cabin boy. For two years he sailed as the “black sheep” of his family before settling in the United States and connecting members living in Missouri and Scotia, California. He saved $700 from his job in a Scotia sawmill and headed for the gold fields of the Mother Lode. In Placerville he bought a team of oxen and began hauling mining machinery to outfit the mines. One job brought him into Mokelumne Hill where he found that log hauling for the mills was in great demand. Silas Field had a lumber mill outside of West Point so Nathan decided to see the man about some hauling. Silas had a luxurious home on the Phoenix Ranch and two teenaged daughters, Ida and Minerva. While talking to Silas in the sitting room, unbeknownst to both men, the daughters were eavesdropping behind a room divider. The mischievous Minerva, suddenly pushed her sister Ida into the room with the men and she landed on Nathan’s lap. Their introduction was unorthodox but Ida must have left a lasting impression because she and Nathan were married three years later. In the meantime, however, Nathan was establishing himself as an indefatigable worker, taking on hard hauling jobs that no one else would tackle. The rich timber tracts and the deep mining boom kept his hauling business going and got him acquainted with the Angels Camp and Arnold areas and the men who were in the mining business. One day Charles Lane, the owner/promoter of the Utica Mine talked Nate into going into the sawmill business, promising him he could use all the lumber Nate could deliver. Nate had worked in the Scotia Mill, he was hardworking and prosperous. He was newly married. He had money saved and it sounded good to him. He contacted his brother, John and the two proceeded to look for timberlands they could buy. Dr. W. M. Jones had a 160 acre homestead five miles off Moran Road. Another homesteader, Metz, had a tract below Jones and later the Love family, for whom the creek is named, had a one man saw mill on the creek below Metz. They bought the Jones property, 160 acres for $800, and found themselves in the heaviest stand of sugar pine in the state. It produced 15 million board feet of lumber in five years. While the timber was a bonanza, and the demand for timber acute, it was hard work that made the brothers prosper. They built their mill and bunk house in 1884 and that winter 12 feet of snow fell and the brand new buildings caved in under the heavy weight. They didn’t let the disaster discourage them but went on and rebuilt their Clipper Mill with a three-quarter pitched roof and opened for business in 1885. Part of the success must be credited to the sound business head of Ida McKay who ran the office/bookkeeping part of the concern from the lumberyard that was located in Altaville on property that sits in the general area behind today’s Safeway store. The Clipper Mill employed dozens of men and processed more lumber than any other mill in the county until Blagen moved in. The logs were all hand sawn in those days and the steep terrain and lack of roads made it rough work using mules and oxen, so in 1888 the brothers started laying rails to install a boxcar operation. The wheels and casting for the boxcars were made at the Demarest Foundry in Angels. The boxcars were pulled up hill by mule, loaded with about 4,000 board feet of logs and gravity moved the car swiftly back to the siding with the assistance of a man or boy operating a brake to keep the speed in check. Nathan also bought a steam traction engine that the loggers called Jenny, to work in the woods and in 1909, Nathan bought one of the first Caterpillar tractors from Ben Holt consolidated, the forerunner of the Caterpillar Tractor Corporation. Jenny now sits in front of the Angels Camp Museum. She was last used at the Clipper Mill in 1904. The mill closed operations in 1906 and moved to Merrill Springs in Tuolumne County until it burned in 1922. Eventually, the demand for lumber subsided and Nathan went back to hauling, only this time he hauled rice and wheat harvests to market from the Colusa growing area. Ida and Nathan had four children, Carrie, Ann, Jesse and Clarence. Clarence came “home” to McKays Point after World War 1, after working on Boulder Dam and after contacting the dreaded, incurable disease, tuberculosis. But Clarence was a very sick man. The clean mountain air finally cleared his lungs but he was never really able to work again so he did what he could. He ran the one many sawmill for awhile. He hand cut and sold cedar shake shingles and cedar post. Things he could do slowly on his own time. Then he built the first of several log houses, a beautiful two story log house that sits at the end of Love Creek Road. He admired the beauty of the Love Creek Area and began parceling off the land, but strictly limiting the sales to 10 acre parcels and with the stipulation that the buyer would also have a log house built by himself. He hoped to retain the beauty of the area and still manage a living in his weakened condition. I own property up the river from Samuel Merrill Springs (part of Browne’s Meadows) and have passed through “Sammy Merrill Springs” on the way to our ranch for the last 60 years. It was interesting to learn new information about the mill that operated there. Thank you for posting it. I will follow up by calling CCHS. Hi Jerry. I’ve never been over to Merrill’s Springs. Is the mill site still visible? Or artifacts? Would it be worthwhile for us to come over with the camera? I live on Love Creek and have to agree with this article. Having spent my entire life in the mountains Love Creek is a special place. Once I discovered this area I knew I had found home. On our property I have found remainders of the old railroad and often find spikes. We have not found many old arrow heads or Indian artifacts but perhaps one day we will. Thank you, Paul. Our story is an edited down version of a longer story that was published by the Calaveras County Historical Society. In their original publication there is much additional information about the McKay family, which we chose to to edit out only for space reasons. Copies of the original story are still available from CCHS, I believe. We have a saw blade from the Clipper mill at the Logging Museum, but we don’t have other artifacts from the mill or the railroad. Would you be interested in contributing a railroad tie or spikes that we could use in a future display? While doing research on lumber mills and associated railways in Tuolumne County I found photos in the TCHM of a mill at Sammy Merrill Springs that later was identified as McKay’s last Clipper Mill (thanks to your website and that of the CCHS). Still later from a collection at U.C. Berkeley I found two photos from the mid-20’s of an apparently burned out mill identified as Madary Lumber Co. located in Section 28 immediately to the south of SMS (Section 21). There was a Madary’s Planing Company incorporated in Fresno. California Railroad Commission records show an informal complaint by Madary about freight rates charged by the Sugar Pine Railway between Middle Camp and Ralph. Most recently I found a brief notation in a Sonora newspaper (The Banner of Jan. 28, 1910) as follows: “… A lumber firm in Fresno has contracted to purchase all the timber sawed and McKay brothers, of Angels Camp, will manage the mill to be built as soon as weather conditions will permit a beginning. Lumber is to be delivered at Ralph station, on the railroad. …” The same article stated that 1,500 acres of timber land were bonded to the agreement. The photos of the Madary Lumber Co. mill describe it as a small, circular saw mill abandoned in the early 20’s. The question is: were there in fact two mills or just one? Can you help? Thanks. Congratulations on your research. Madary is a new name to me, so I don’t know if the Madary Lumber Co is the same as McKays. It’s a pretty strong coincidence (as you have clearly noticed) that there are pictures of a burned out mill that is in the right place and time for the end of McKays, and that the mill is titled Madary and that there’s a Madary Planing Co in Fresno, and that a lumber firm in Fresno contracted with the McKay brothers. If there was just one mill, then I would assume that the McKays were like so many other mill owners who at some point found it financially necessary to sell out to another firm. Perhaps the 1910 newspaper story reflects such a sale with the McKays, the former owners, staying on to manage the operation for Madary. It’s equally possible that two mills were there at Merrill Springs. That they could both burn at the same time isn’t too farfetched if the fire that started at McKays mill got into the woods and, fanned by high winds, swept through the area. I’ve thought that McKays mill used the Empire City Railway to carry their lumber out of the woods. The Empire City railway was built in 1906, when the McKays were looking for a new mill location, and the railway ran right past the McKays new site at Sammy Merrill Springs. (At least I think it did. I think Forest Road 3N92, Browns Meadow Road, is the old Empire City right of way.) Might the 1910 reference reflect that the Madary company was going to _not_ use Empire City/Sugar Pine Railways but, instead, freight their lumber all the way to Ralphs on the Sierra Railroad? I’d be curious if you’ve found any indication in any photos of the McKays or Madary mills that they had a rail siding or loading platform on the Empire City Railway? Similarly it would be interesting to know if there are any photos or stories about freighting (horse-drawn or steam traction) their lumber out of the woods. Good luck with your research. Please let us help if we can. There is a small settlement of older cabins at Samuel Merrill Springs. In the late 50s it was mostly Italian retirees who were really kind to me when I ventured out on my bicycle from Browne’s Meadows. I doubt that a picture trip would produce much in the way of meaningful photographs. You might make an effort to get to know some of the long-time locals of SMS and get some pointers about where things were situated. Milt Lemas (sp?) used to live there. My dad knew him; he may have passed away by now. I think his descendents still have one of the cabins there. They might have some useful information. Last year I found your museum location, but you were closed… it was late afternoon. I will try to make another effort to visit in the near future. Your efforts to preserve elements of the early logging history of our region are greatly appreciated. As a followup to my post of February 23rd subsequent research findings confirm that there was only one mill at Sammy Merrill Springs. John Mckay was associated with the mill until he filed suit against Madary in 1914 for monies due for labor and services. After that date Madary appears to have managed the sawmill operations with personnel from Fresno. I found no evidence of McKay’s post-1914 involvement with the mill. I have never found any reference to the mill at SMS as the Clipper Mill. Sonora newspapers always referred to it as the mill at Sammy Merrill Springs from its inception in 1910. The mill burned in 1921. I spent alot of time there growing up (Reeves Cabin; 3rd on the R as you enter SMS from Long Barn). My uncle, Chuck Reeves, bought 80 acres of SMS back in 1960 from John Mills? He used to “harvest” sawdust from the old mill site for his gardens. What’s left (if anything) of that old sawdust pile is just below the Edwards cabin (1st cabin on the right). The Old Busso cabin: 2nd from last, on L (after you veer L on Brownes Meadow Road from 3N01). I wish to contact Sylvia Large regarding the photos of SMS. My message to the e-mail address provided was returned for reason of an unknown addressee. Paul Reeves was unable to furnish another means of contact. We have just recently moved back into the country from overseas; the pictures are in shed in CA and we’re spending the summer in Alaska! I can get them to you in a few months… need an address. Sly, Please contact me ASAP. Thanks. I live in Clipper Mills Ca. and am familiar with the Bean Ranch. There are still some descendants of the Beans in the area. Clipper Mills was also a 1850’s logging community. I’m sorry to have to tell you that to the best of my knowledge, we have no information on Clipper Mills in Butte County. You might try the Butte County Museum. I would like to use one of your images for the cover of a book I’ve written. Rails to McKays’ Mill. Please email me about cost. Thank you. Credit given for the source of the photo and six copies of your book for us to sell.